2012 Weingut Andreas Schmitges, Riesling, Kabinett “From Red Slate” Mosel Germany. This gorgeous and bright Riesling is from the middle Mosel and is grown on unique red slate soils, this site used by Schmitges gives a lovely intense fruitiness and spicy character, and while the 2012 Red Slate is Kabinett it has plenty of acidity, savory elements and mineral underpinnings making it feel almost trocken and well balanced with just a bit of juicy sweetness. I am highly impressed with Schmitges and all of their fine offerings, but I’m thrilled by the quality and value in this beautiful Red Slate Kabinett, it should be a must have Riesling for this great vintage and it should age well too. 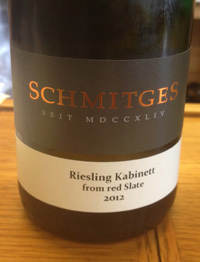 The 2012 Schmitges Riesling Kabinett from Red Slate is vibrant, poised and wonderfully detailed with tangy fresh yellow peach, rose oil, white tea, apricot, spiced pear, apple and lime layers, slightly creamy on the palate with some vivid tangerine and tropical essences along with a flinty spice and loads of steely wet stones. There is a lingering taste of brine, sea salt and honey, but finishes crisp and refined. This is super stuff, a great food wine especially with asian fare, very cool and dynamic with class and style, Schmitges is a winery to check out no question, the Mosel is full of great wines with Selbach-Oster, Knebel, Prum, Thanisch, von Hovel and many more, but you should not overlook Weingut Andreas Schmitges, these are terrific wines and this one surely is one of the best values out there, drink from 2014 to 2025, imported by Dee Vine Wines.